Hands up who likes Pizza?! Well now that we've ascertained that we’ve all tucked into one of the world's most popular dough based foods, we have however, certainly never seen it cooked like this before. 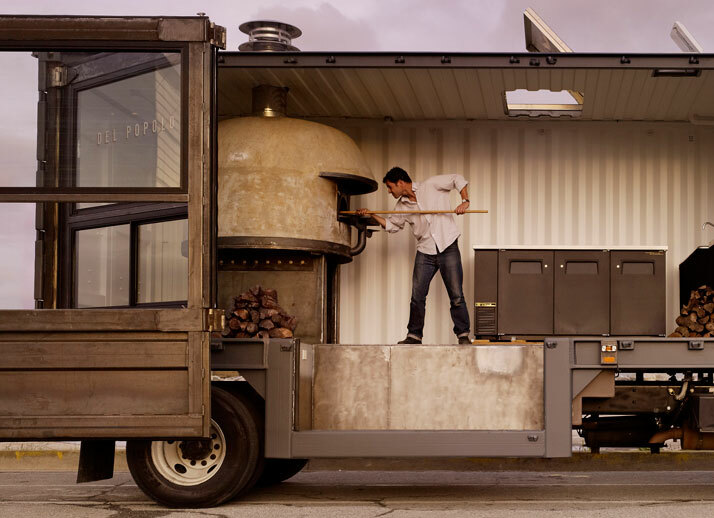 It's pretty impossible not to gasp at the first sight of Del Popolo, a mobile pizzeria that features a 5000 ld Stefano Ferrara wood burning oven (capable of producing 72 pizzas) in a modern glass enclosed exhibition kitchen. This set up would look more than impressive in a kitchen, on the back of a bob trail truck, it takes another dimension. This combination of portable pizza for the people, functional cookery, age old technique and incredible design is pretty mind blowing. 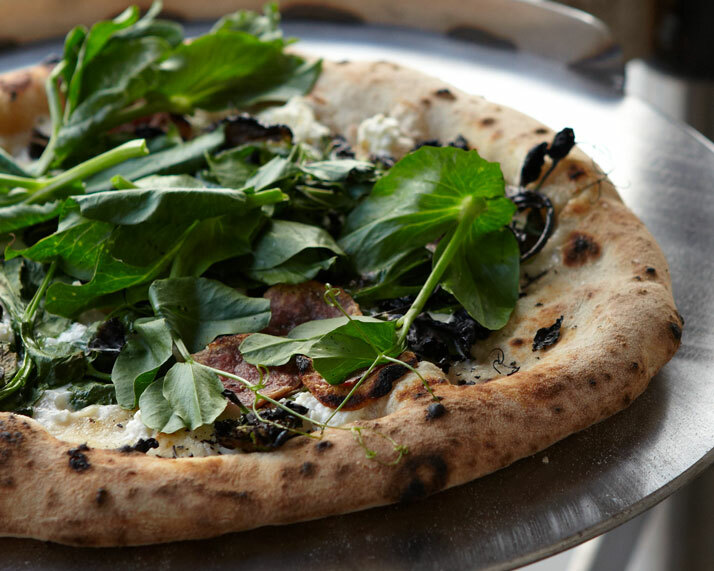 Jon Darsky, the original Pizzaiolo who opened flour + water, has returned to the San Francisco restaurant scene. Whilst originally planning to open a revolutionary brick and mortar pizzeria, Darsky's ambition to bring exceptional pizza to the people - the name Del Popolo means ‘of the people’ - spiralled to new exciting heights and led to the desire to develop mobile foods in a modern stylish way. Welcome to Del Popolo. Here, the sheer joy of watching the craftsmanship and preparation of a perfect stone cooked pizza is being delivered in a new stylish mobile operation. 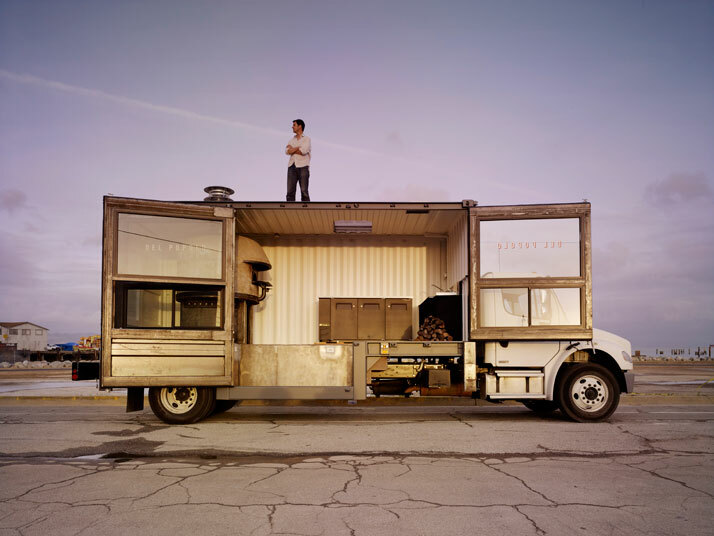 Lucky Del Popolo customers can eagerly watch their pizza being prepared within a stylish kitchen that despite being on the back of a truck encompasses traditional techniques. 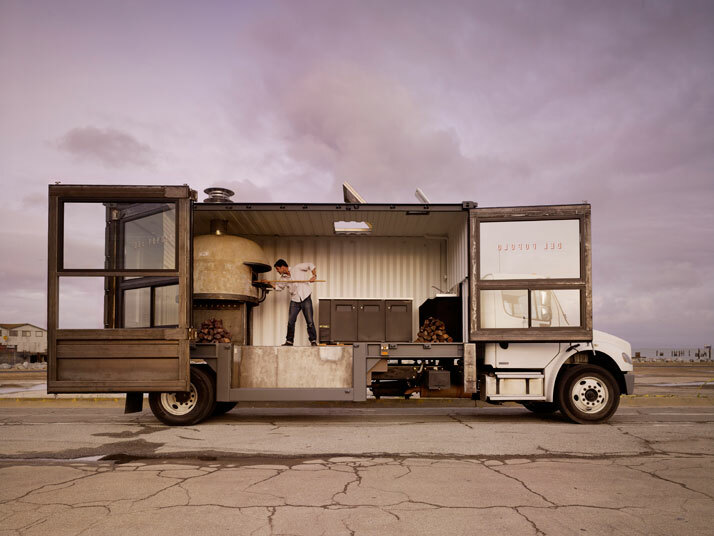 Darsky has eliminated the awkward and robotic feel of queuing at a food hatch by including a plane that brings the customer much closer to the careful preparation of Neapolitan-inspired pizza - creating a uniquely relaxed yet unforgettable culinary experience. Darsky may be the primary designer, but he employed a local designer to translate his ideas and ''make the concept real on the computer'. 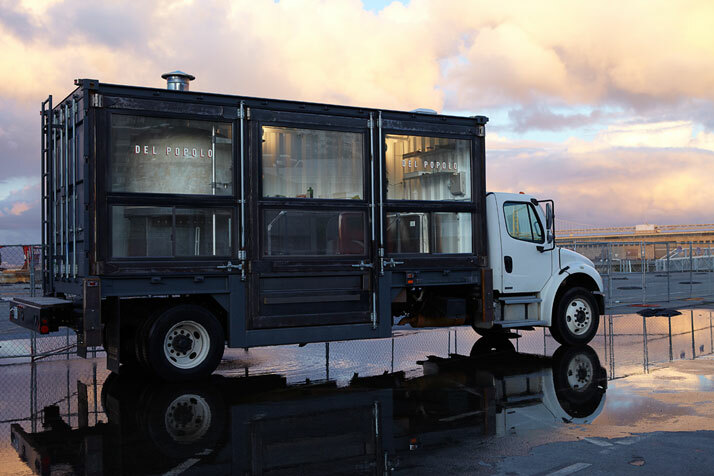 McLellan Industries in Hanford, California, which specializes in heavy-duty mining equipment, truck parts and safety systems, handled fabrication and production, and this combination of skills, has resulted in a mobile pizzeria that encompasses functionality, style and a modern vision. 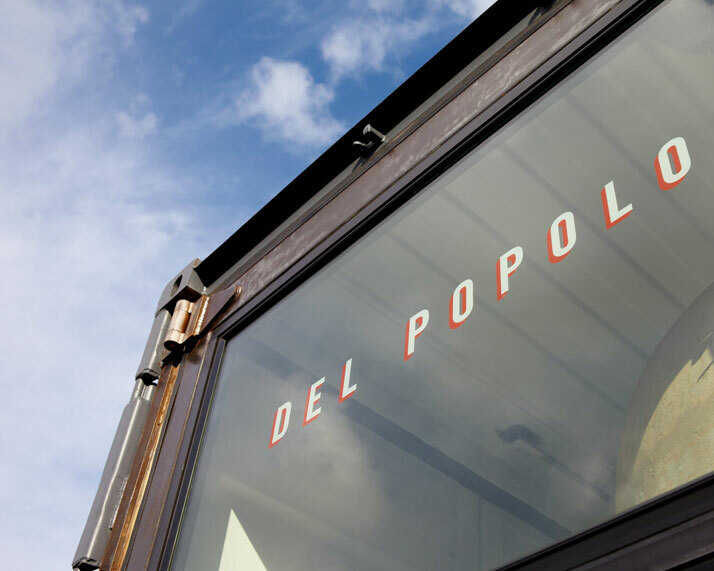 The traditional function of this transatlantic shipping container mounted to a Freightliner M2 truck has enabled Del Popolo to really encapsulate the rustic experience of enjoying a delicious authentic stone baked pizza in a fun and surprising new way. 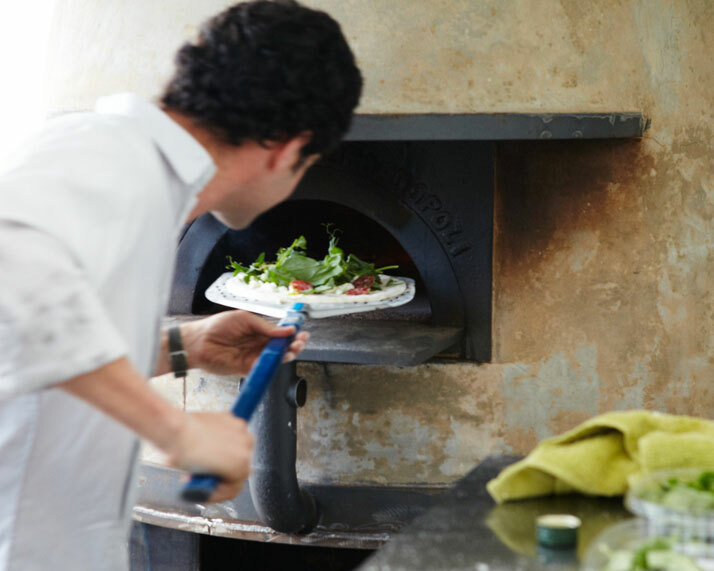 Del Popolo has been designed around the idea of inclusivity - bringing pizza to the people – and it’s achieving its aim; delivering great pizza from an impressive kitchen on a functional mobile vehicle. This is a very special and forward thinking pizzeria that’s essentially a modern idea on a traditional base. Now hands up, who's hungry for amazing design plus pizza? Follow the truck on Twitter and Bon appetit! !